At 3,724 metres, Aoraki / Mount Cook is half the size of famed 8000 metre peaks in the Himalayan and Karakoram ranges, and smaller than those of the Seven Summits, except for Australia's own Mount Kosciuszko. But what Aoraki lacks in size, is made up for in technical difficulty, heavy glaciation and severe, ever-changing weather, making it a trial to be tested only by experienced mountaineers when weather allows. For Sam Smoothy, his desire to climb the perilous peak came first from hearing of his parent's experience on the mountain. The Sky Piercer, a CoLab Creative film, is a homage to the country he loves, and its highest mountain. The film, The Sky Piercer, has hit the international film festival circuit, starting with High5 Festival in Annecy, France. You can catch the film in Australia this month. Watch the trailer and find tour dates for Sydney and Melbourne at the bottom of this article. 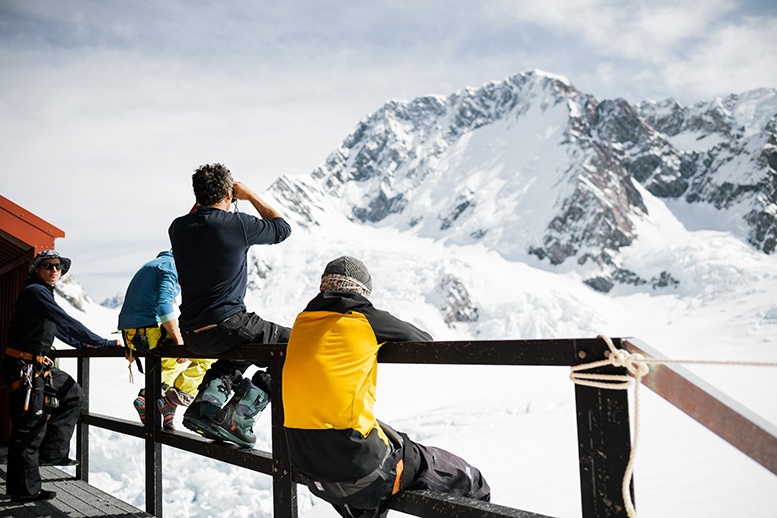 In the film, professional skiers Sam Smoothy, Nadine Wallner, Fraser McDougall and snowboarder Xavier De Le Rue set out to ascend and ski the East Face of Aoraki/Mt. 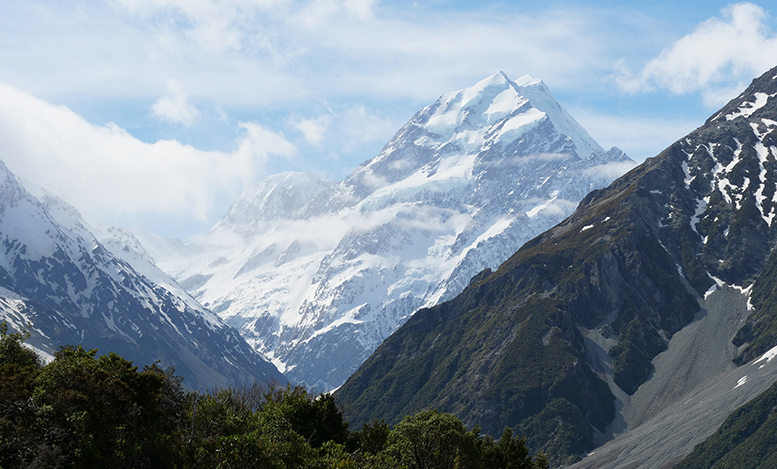 Cook – New Zealand’s tallest mountain. With a seventeen-day weather window, the team get their fair share of down days - which they easily fill with the outdoor adventures the South Island of New Zealand offers. The team get in some mountain biking, surfing, and rock climbing - all the while their objective, Aoraki/Mount Cook, looms in the background. We chat to director Jase Hancox of CoLab Creative about his experience working on this home grown Kiwi project, and being a long time partner in film and adventure with Sam Smoothy. Since premiering at the New Zealand Mountain Film Festival, The Sky Piercer has now started touring around the globe, has received accolades locally and internationally and has been selected for the Banff Centre Mountain Film Festival. How does it feel to have this project out in the world receiving great acclaim? JH: To be selected as a finalist at Banff is amazing! It really is quite special to receive an award for a film but we do see Banff as the top international adventure sports film festival so it's definitely a solid pat on the back to have it playing there. Upon premiering at the New Zealand Mountain Film Festival, your film received the Hiddleston/MacQueen Award. What does this mean to you and the team to receive an award in honour of these two renowned Wanaka mountaineers and the spirit of adventure that they lived for? JH: It's an absolute honour. Wanaka is an amazing place full of people who are here for adventures. Both Sam and I were away (at my wedding) when it screened in Wanaka, but Fraser was there to present the film to a packed building of people who all share that same spirit for adventure. I love being able to share adventures with people, being able to showcase these adventure stories in the most beautiful and cinematic way. Doing that to the point of receiving awards is the ultimate goal, so yeah, very stoked to receive this award. Sam Smoothy had the desire to climb and ski Aoraki/Mount Cook after learning of his parent’s own experience on the mountain. What was your relationship to Aoraki/Mount Cook before stepping into this project, and how has it evolved since working through it? JH: It is such an epic mountain. I've spent a lot of time filming in the mountains around Aoraki Mount Cook - it has such a presence towering above everything. Sam and I have talked about making this film for a long time, and over the past 4 to 5 years with Fraser also. But we all really wanted to do the film justice. As a professional filmmaker, this does require budget and Audi's involvement gave us this opportunity. I really wanted to build Aoraki as a character as much as the athletes through the film. I would have liked to have gone deeper into this side of the story but we were limited a bit by time. It is such a special mountain in the history of New Zealand and it holds a pretty special place for me now also. You’ve filmed with Sam Smoothy in Vanuatu, Bolivia, Japan, Switzerland– what’s the significance for you, filming on your home turf this time with him? JH: I think the significance was showing that we don't need to go to the other side of the world to create meaningful ski and adventure based stories. Over the past few years, Fraser and Sam have really been getting after it in the New Zealand backcountry and we have all started to look closer to home to develop interesting storylines for future films. I'm definitely really proud of this being an New Zealand film. You’ve had a longstanding career working with Sam Smoothy - what makes a solid filmmaker to athlete partnership? JH: Patience and beer. The filmmaker needs to understand that the athlete isn't an actor and the athlete needs to understand that it takes more than just skiing or 'action' to create an engaging film. The athletes often get frustrated with camera crew not moving fast enough in the mountains. They seem to forget that we are carrying three times the weight that they are. But we get our own back, after they fall down the face we've all spent 4 hours climbing to get into position to shoot. At the end of the day you have to be able to laugh it out and drink a beer with everyone... it's only a ski movie after all. You cited one of your favourite segments of the film is Sir Tipene O'Regan’s delivery of the cultural significance of Aoraki/Mt Cook. What is the importance of this kind of storytelling in a ski film? JH: It's not important for a ski film specifically but it was important to me early on. Xavier and Nadine are both from Europe where the mountain culture is about summiting - if you weren't on the summit, don't talk about it. They explained this to me at the beginning of our trip when we started to discuss the cultural significance of Aoraki/Mt Cook. At that point I knew I wanted to make it a significant part of the film, I would have liked to have added ten minutes more to the film, with more from Sir Tipene in there. I think I can speak for Fraser and Sam when I say that as Kiwis, we are proud of our culture and our history. To be able to show the mountain communities around the world a glimpse into this culture is massive for us. 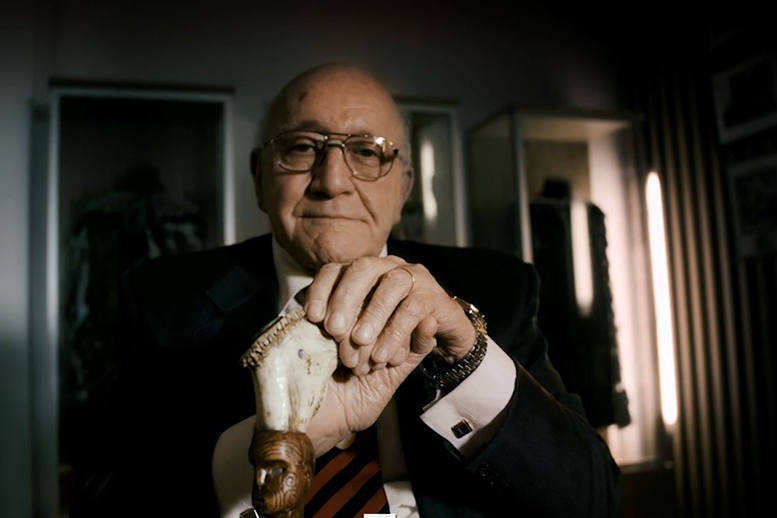 Sir Tipene has such a powerful presence and we are absolutely honoured that he took the time out to take part in this film. 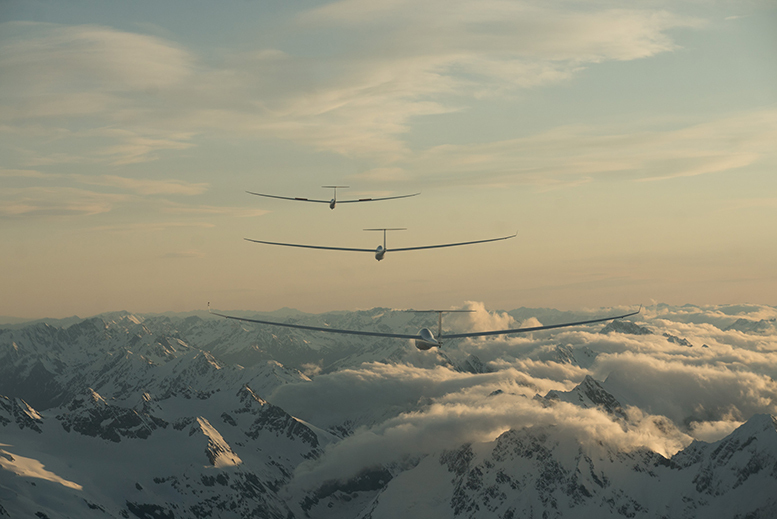 The above photo gives people a glimpse of the incredible scene in The Sky Piercer where the team go up in glider planes (to be clear, tiny planes with no engines) to have a closer look at the conditions on Aoraki/Mt Cook. You’ve named this scene as the most epic sequence you’ve ever created to date. Tell us about putting this sequence together. The music is powerful part of it as well – how did you choose the tunes for the production? JH: A helicopter chasing 2 planes and 3 gliders as they take off down the runway heading into the Southern Alps. Do I need to say more? Fraser is such a talented man, he has been flying gliders for about 5 or so years. When the opportunity came to create this film we couldn't not make this sequence. Fraser took me for a flight in April while we were still in the planning stage of the film and it really is the craziest experience. I instantly knew it would be the most incredible sequence if we could pull it all together. Gavin Wilis of Glide Omarama is the man behind the gliders. He was the lead pilot and aerial coordinator for the shoot and it wouldn't have been possible without him. There were so many layers to this sequence that all came together to make it happen. Queenstown Camera rentals with their Shotover Gimbal, Nick Wallis from Alpine Heli, the weather conditions, and the skill of the glider pilots to get to Mt Cook. As for the tunes, Danny Fairley is the musical wizard for everything you hear in this film. I've been working with Danny for about 7 years now and I can trust his incredible talent to create the tracks needed. Most of the time we'll put a placeholder track in the film to edit to and then pass it over to Danny to make a track with the same vibe and tempo as the temporary track. In this instance, there was no temp track needed. He knew what the footage needed and how to do it justice. He is such an asset to have working on any of our films. Where do you think you and Sam Smoothy will be off to explore next? JH: We have ideas we are floating at the moment, so watch this space. No matter where we go next we'll be keeping the team together, with Andy Bamford editing the film and Danny on the audio. Filmmaking is such a team effort, everyone worked so hard to make this happen. The film wouldn't be anywhere near as good if I had edited it, so massive thanks to Andy too. Keep up to date with our latest athlete news and community events by following along on Facebook and Instagram.